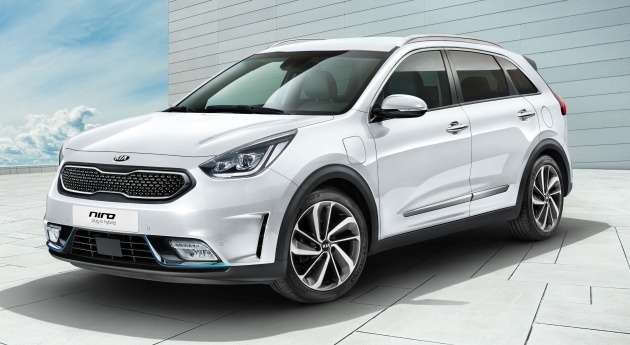 A year after Kia introduced its series production Niro Hybrid, the follow-up act arrives in the form of the Niro Plug-in Hybrid, which makes its official debut in Geneva. To differentiate the car from the existing Niro hybrid, the PHEV version gets some revisions to the exterior and interior design. There’s a new satin chrome grille surround as well as special chrome accents – with a clean metallic-blue finish – on the blades in the front and rear bumpers. A choice of single-tone black leather or two-tone light grey/black leather upholstery – finished with blue stitching – is available for the interior, and the PHEV’s cabin also gets a new blue surround for the dashboard air vents. The new derivative features a new 7.0-inch full-TFT driver instrument cluster, which displays key information about the powertrain, and there’s an 8.0-inch touchscreen infotainment and navigation system, configured for the PHEV to display current electric-only range and location of nearby charging stations. The Niro PHEV is equipped with the same 1.6 litre Kappa GDI engine as found on the hybrid, with identical output figures for the mill (105 PS and 147 Nm). The plug-in has a more powerful 44.5 kW electric motor, up from the 32 kW unit seen on the hybrid, and the battery has also grown in size to a 8.9 kWh high-capacity lithium-polymer unit, a jump up from the 1.56 kWh battery pack on the hybrid. Nonetheless, the total power and torque output for the PHEV’s powertrain is identical to the hybrid, with 141 PS and 265Nm on tap, delivered to the wheels via a six-speed dual-clutch transmission. The plug-in is a shade faster than the standard Niro, doing the 0-100 km/h run in 10.8 seconds, making it 0.7 seconds quicker. Safety-wise, aside from vehicle stability management and electronic stability control, the PHEV features a raft of active hazard-avoidance technologies as standard. These include autonomous emergency braking with forward collision avoidance assist, lane keeping assist and driver attention warning. Optional items include smart cruise control, blind-spot detection and rear cross traffic alert. The Niro PHEV – which will be built at the automaker’s plant in Hwasung, Korea – will go on sale in Europe sometime during the third quarter of the year. Wow, this KIA Niro PHEV is going to Geneva & then to showroom/sale Q3 2017 & P1 is still pondering who should be its partner.